It’s still winter for a few more days. So snuggle down under the blankets, read bedtime stories and wrap your hands around a warm mug of Parisian hot chocolate. If it’s neither windy or chilly, I suggest a proper rain dance. It’s often forgotten that chocolate stems from ancient Mexico where the Olmecs made an unsweetened drink reserved for the emperor, the elite and warriors going into battle. Later, the Aztecs and Mayans used the cacao bean as currency and a unit of measurement. The Spanish took it home to Europe where sugar, vanilla, cinnamon and pepper were added to it. It wasn’t until the 19th Century when the Swiss added milk. The French are known for their love of butter and heavy cream, but as luxurious as it sounds, chocolat chaud is made simply with milk. The richness comes from the chocolate itself. This cup of drinking chocolate is a snap to make, which is especially welcome at the end of a long day when you’ve got your pajamas and slippers on, but you need a little something to give you sweet dreams. Note: Make a few hours ahead and store in the fridge. Reheat and serve. Heat milk gently in a small saucepan. Chop chocolate and add to hot milk. Stir til the chocolate melts. Add vanilla, pour into cups and enjoy with someone sweet. We’re expecting rain this weekend, which would normally make most people very unhappy, but pleases me, because it means cozy days, spent at home, relaxing with my family. 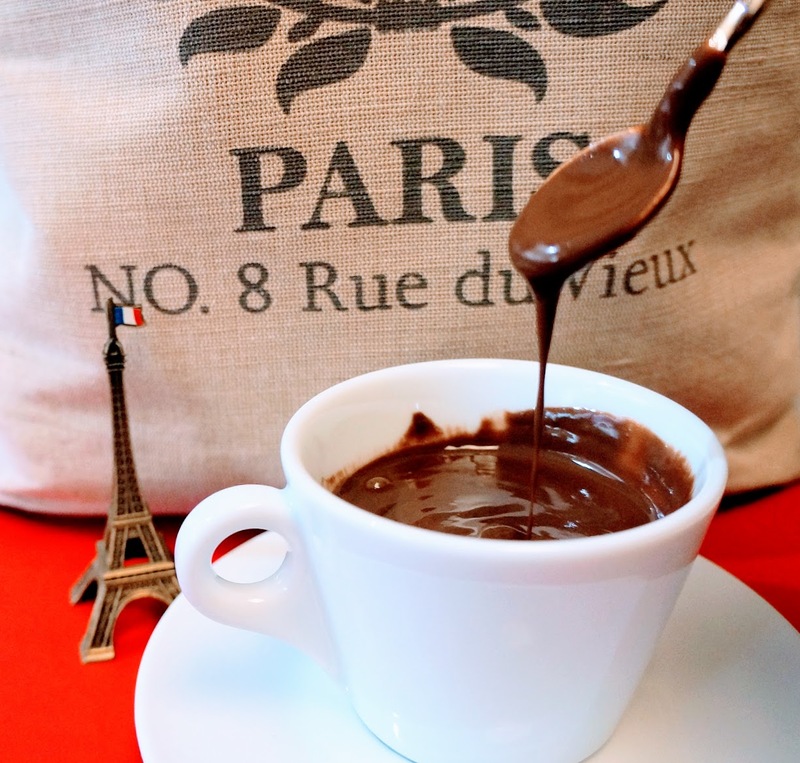 I’ve already got a batch of Parisian hot chocolate waiting for us in the fridge. All I have to do is wait for nightfall, heat it up so we can enjoy it before bedtime. Sweet dreams are sure to follow. Oh my gosh, Colette! YUM! How did I miss this? So rich and luscious and yes, so perfect at the end of a long day. We all deserve the best chocolate!